Jackie Smith for winning a copy of Perennials! Michelle Cefalu for winning a copy of Talking to Jesus! Stephanie Halcomb for winning a copy of Give Your Kids a Break! Winners, please e-mail your mailing address to my assistant Christen (amy@triciagoyer.com). 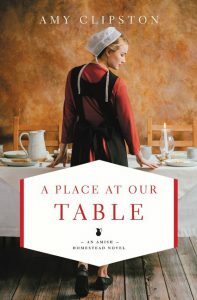 Enter below for a chance to win a copy of Amy Clipston’s A Place at Our Table or An Amish Christmas Love! I would have to choose The Outsiders by S.E. Hinton. I read it at least fourteen times when I was a preteen and teenager, and my copy of the book nearly fell apart. Susie Hinton’s books always touched my heart, and I still remember being completely engrossed in Ponyboy Curtis’s emotions while reading that story. Again, I would choose The Outsiders by S.E. Hinton. That book started my creativity flowing and I began to create my own stories in my head after being completely emerged in Ponyboy Curtis’s world. Since I work full-time, write several books per year, and have two boys in school, I rarely have time to read. I fit in books for pleasure when I can via Audible. I download books to my phone and I listen when I’m commuting to and from work or when I’m doing data entry type work at the office. Sometimes I also listen to books while I’m doing chores around the house, such as putting away laundry. I only listen to audio books for fun between my own book projects since I find reading for pleasure distracting when I’m writing my own books. Young adult is my favorite genre, and the last book I listened to for pleasure was Interference by Kay Honeyman. I found the book by accident while browsing Audible, and it was fantastic! I enjoyed the story and I loved the characters. The story was complex and so much fun. I was even surprised by the ending. It was very well written, and I highly recommend it! A dear friend, who is a librarian, recommended Dee Henderson’s O’Malley series, and I plan to download the books when I have a break between upcoming book projects. I’m excited to check out the books since she has spoken so highly of them. I’ve already added them to my Wish List on Audible. I’m really excited about Kathleen Fuller’s Words from the Heart, the third in her new An Amish Letters series, which will be out in February. Kathy’s new series is fantastic, and I’m enjoying each book! I can’t wait to read the next installment. The cover is beautiful, and I’m counting the days until I can get a copy for my mom and also download it through Audible for myself. I’m also excited about Room on the Porch Swing, the second in my new Amish Homestead series. It will release in May. The first book in the series, A Place at Our Table, centers around Jamie Riehl, the oldest son in the family. The second book will tell Laura Riehl’s story. I can’t wait for readers to find out more about my Riehl family. The story is very close to my heart, and I hope readers enjoy it as well. 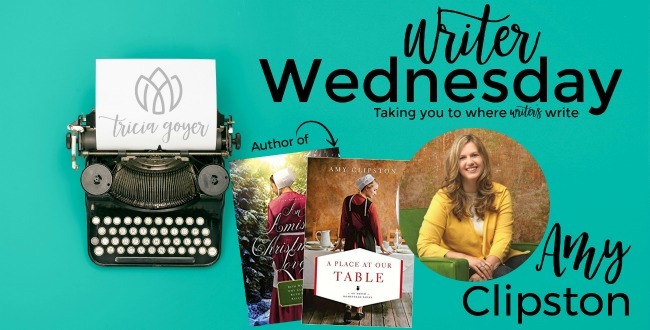 Amy Clipston has sold more than a million books and is the award-winning and bestselling author of more than thirty novels, including the Amish Heirloom series, Kauffman Amish Bakery series and the Hearts of the Lancaster Grand Hotel series. Her novels have hit multiple bestseller lists including CBD, CBA, and ECPA. Amy holds a degree in communication from Virginia Wesleyan College and works full-time for the City of Charlotte, NC. Amy lives in North Carolina, with her husband, two sons, mother, and three spoiled rotten cats.